Wed, Oct 17, 2018, 11:50 pm SL Time, ColomboPage News Desk, Sri Lanka. 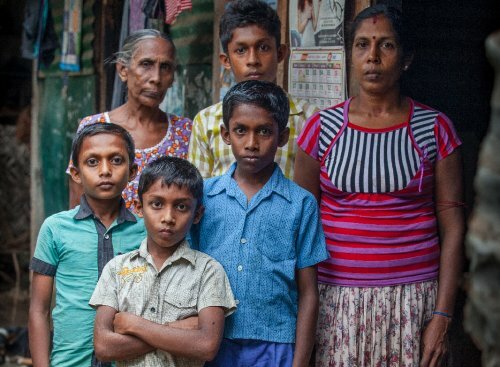 Oct 17, Colombo: The United Nations Development Programme's (UNDP) Resettlement in Newly Released Areas (RNRA) scheme, provides livelihood assistance in sectors such as Fisheries, Agriculture and Livestock to vulnerable families in Northern Sri Lanka. There are nights when Udayakumar Manjula wakes to find her house flooded. Heavy rains bring water seeping under her door to where she and her family lie sleeping. While they wait for it to subside, she props her children up on plastic chairs. "Sometimes they go to sleep sitting up," says Manjula. The family is hoping they will soon be allocated funding from the state to build a house, but in the meantime it is hard going. Manjula's husband, 42-year-old Selvarasa Udayakumar works as a porter in the local market, carrying goods for traders. For this he is paid Rs.800 a day. The family of seven - which includes Manjula's mother, 70-year-old Devendram Natkunadevi - must manage. Then came the war, and with it multiple displacements. Trapped in the fighting, Manjula recalls how her then 21-year-old sister was killed by a shell. She has only one picture of Dharshika. It is from her sister's coming of age ceremony - in it, the young girl, dressed in a pink saree and adorned with flowers, looks seriously at the camera. The family has little else to remember her. "We carried nothing with us - we ran to save our lives, we couldn't stop to save our possessions," says Manjula. Even as she struggles to cope, Natkunadevi says she is still filled with grief - "After the death of my daughter, my world is dark." At the end of the war in 2009, the family found themselves in Menik Farm, a camp for the internally displaced. From there, they came to this plot of land near Jaffna, which Manjula's uncle gifted them. Now, they are painstakingly trying to rebuild their lives. The first piece of good news came when the family was chosen for livelihood assistance. Under the United Nations Development Programme's (UNDP) Resettlement in Newly Released Areas (RNRA) scheme, a rapid assessment was carried out to identify families in sectors such as Fisheries, Agriculture and Livestock who could benefit from support and training. The project emphasized helping these vulnerable households engage in sustainable local economic development initiatives, in collaboration with government entities. Their history, current context and interest in the project were all taken into consideration when the family were chosen to be beneficiaries of the RNRA scheme, says Sinnathamby Inparuban, a program manager at the Centre for Child Development (CFCD). Working closely with the local divisional secretary, CFCD identified vulnerable families, who then received training, business development support, business planning and initial seed capital. "We had to prepare them, and we had to strengthen them," says Sinnathamby. In the end, raising cattle was a good option for Manjula, one that allowed her to take care of children, and watch the home even as she generated some additional income. Her income is still modest, around Rs. 1,000 per day, but this is enough to pay the tuition fees for her boys, and still have something left over. After all they have been through, Manjula hopes there are now good times ahead for her family. "We want the children to do well in school, so they will not have to struggle like we have," she says.